Description: Some Things You can Only See From the Top. Renewing The Mind Library. Who will take the challenge? 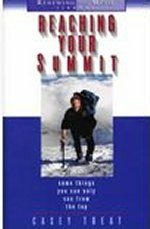 In this book Casey Treat invites you to stop living in the lowlands and daring to climb. Don't settle for a distant view of who God is - discover the reward of climbing.